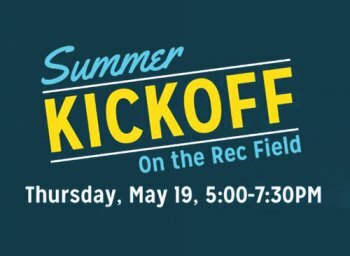 The Marshall Recreation Center will be hosting its first Summer Rec Kickoff event from 5 to 7:30 p.m. Thursday, May 19, at the Rec’s intramural field. Everyone in the Huntington community is encouraged to attend the kickoff. This is an open house event for a variety of the summer programs that will be offered at the Marshall Recreation Center. There will be both youth and adult programs available, as well as coupon deals of which to take advantage. Healthy Herd Youth Camp staff will be available to talk with parents who are interested in summer camps for their children. Youth camps begin the week of May 31 and run the entire summer. Kids can enjoy free face painting, inflatables and an obstacle course. Information about group and private swim lessons will also be provided. Outdoor Pursuits will display outdoor equipment that is available for rent. Some of the equipment available includes canoes, kayaks and tents. There will be an adult soccer sport league available for students and non-students this summer. More information on how to register will be available at the summer kickoff event. Studio X will have free demos of the new high-intensity workouts offered, as well as passes for individuals to try out this new service. Group fitness classes and Acro Yoga will be available for any participant who wishes to jump in and try out a class. An information table will be set up for anyone interested in memberships at the Marshall Recreation Center. Memberships are available to anyone who is affiliated with the university through Big Green, the Alumni Association or as faculty/staff. In addition to all these activities, The Naked Run 5k will take place at 7 p.m. Runners will be asked to predict their 5k finishing time and then run the 5k without a watch or phone. An award will be given to the runner who can predict his or her 5k time the closest. Anyone who crosses the finish line could be the winner. The 5k course will take place around Marshall University’s Huntington campus and will start on the sidewalk next to the Rec Center. You can sign up online in advance at www.aptiming.com/race/273, or on the day of the run. The race is free, but donations are accepted to support Girls on the Run of Cabell and Wayne counties. All donations received will go towards costs to provide this after-school program to girls in grades 3-5 in Cabell and Wayne Counties. For more information, please contact Michele Muth, Assistant Director of Marketing and Membership, via e-mail at pallante1@marshall.edu or by phone at 304-696-2943.